How to Migrate or Change Server? 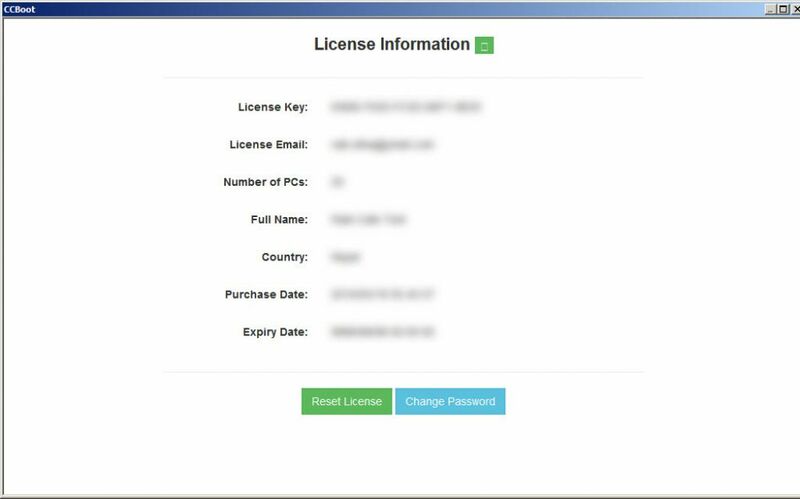 Since the version 20160405 the licensing system has gone through a overhaul to make it easier for you. Now, authentication is done based on Email and Password rather than just license. 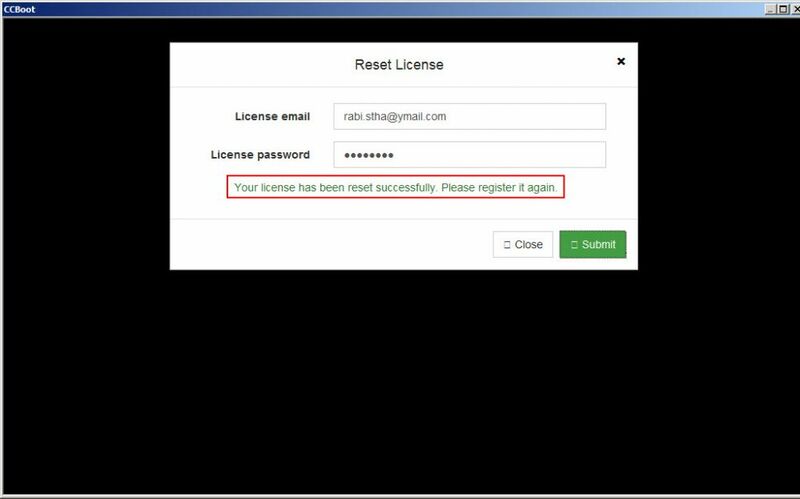 In the versions since 20160405, we have added a new dialog box named “CCBoot Web Browser” to make viewing license information, activating your license, signing up as well as resetting your password. Let’s start with “Signing Up”. Click the “Click here to sign up” link, it will open “CCBoot Web Browser” with signup page (see Figure 1-2). If you are testing CCboot then check the “Trial User” option. Once completed, you can sign in to CCBoot and use your license. 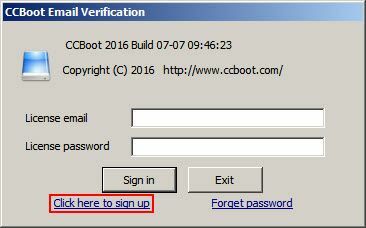 Close the window and on “About CCBoot” dialog box enter the email you used for signup and password to sign in to ccboot. Once, your email and password is validated, “CCBoot” dialog box will open, saying “Register OK”, click the “OK” button to close the dialog box (as Figure 1-4). After you close the dialog box, another dialog box “CCBoot Web Browser” will open showing you, your license information (see Figure 1-5). If you ever forget your password, you can easily recover it. 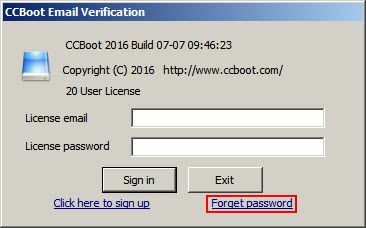 On the “About CCBoot” dialog box, click the “Forget password” link (as in Figure 1-6 ). 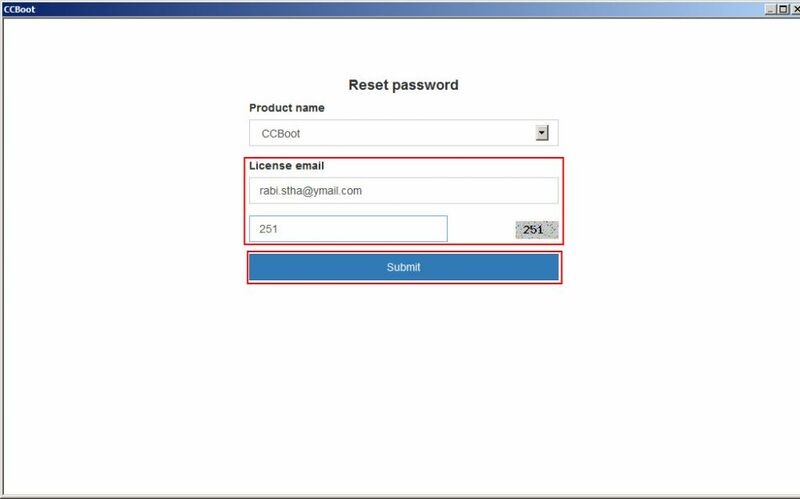 It will open “CCBoot Web Browser” with reset password form. There enter your “email address” you used to sign up then click “Submit” (see Figure 1-7). An email with link to reset password will be sent to your email. Open email and click the link, it will show you new password. You can use that password to login and change it to suit your need. 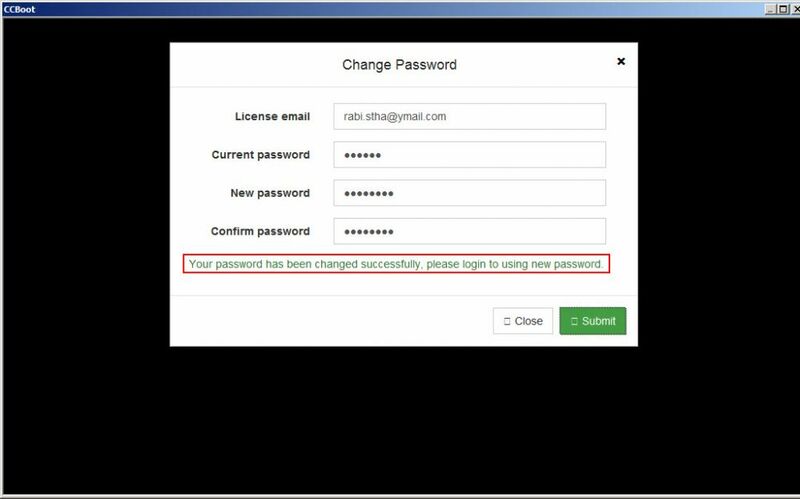 Once you have attained the temporary password you can use it to change to different password. 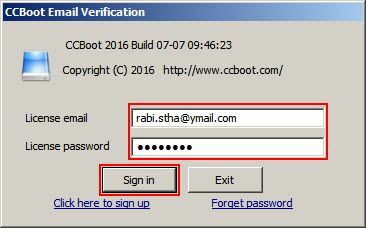 Open “About CCBoot” dialog box and sign in using the email and the acquired password. Once signed in click “OK” to close the dialog box. It will open “CCBoot Web Broswer” with you license information (as Figure 1-8). 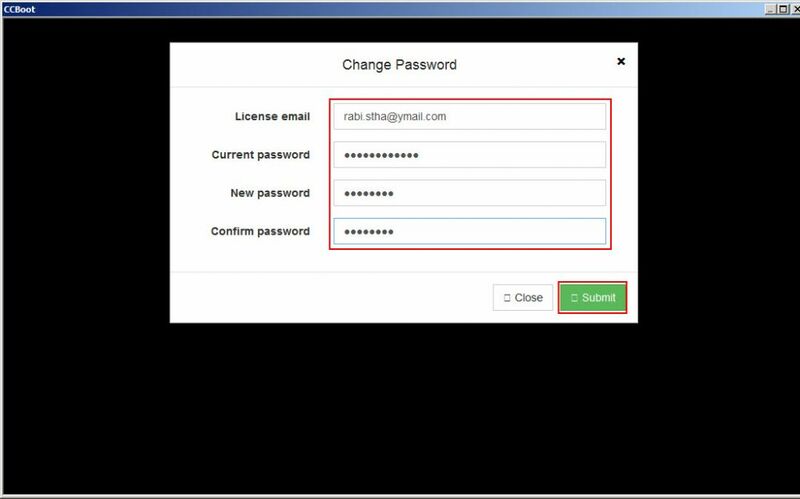 Click the “Change Password” button, it will open a dialog box to change password (see Figure 1-9 ). Enter your current password, then enter the new password “New Password” and “Confirm Password” field. Once you are done, click the “Submit” button to change the password. Congratulation, you have successfully changed your password. 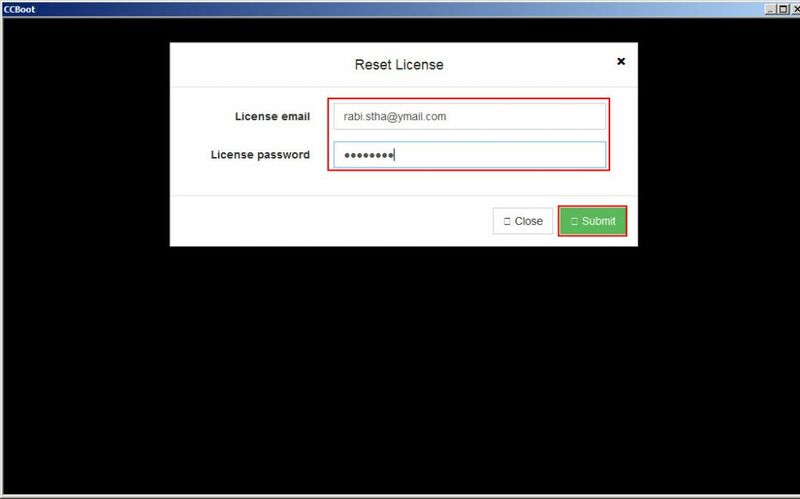 You need to reset your license if you have done two things. 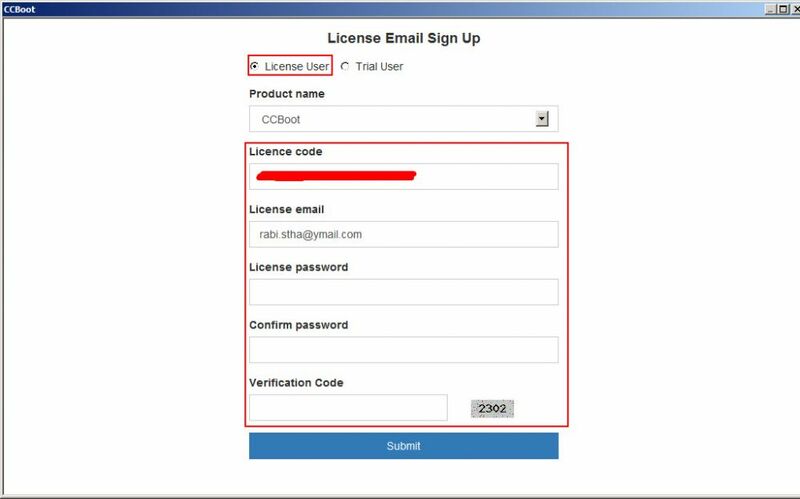 To active your license, you will require your email address and your password. 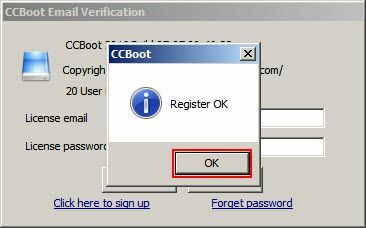 Open “About CCBoot” dialog box and sign in using the email and the acquired password. Once signed in click “OK” to close the dialog box. It will open “CCBoot Web Browser” with you license information (as Figure 1-11). Click the “Active License” button, this will open a dialog box to reset you license (as Figure 1-12). Now enter your email and password in appropriate fields and click “Submit” button. Once your license has been reset, green success message will appear above “Submit” button (see Figure 1-13). Now, you can apply your license to your new server or your old server with re-installed OS.